My makeup brushes go through quite a war everyday and despite daily spot cleaning, the gunk really starts to build up which inevitably starts contaminating all of my colors. And let's face it, it's not just color but these things are hotbeds for all kinds of germs and other ooey-gooey things. In order to preserve the original brilliance of all my shadows and blushes, as well as ensure that makeup is not a case to blindness or mysterious infections, every week (every month, more realistically) I have a makeup brush spa day and really deep clean all of my brushes. Here is my step by step break down of how I achieve the drastically difference displayed above. First up is a makeup brush cleanser. This is the same bottle I use for spot cleaning and I begin this routine with the same motions I do everyday. My bottle is from BH Cosmetics, but any type will do, these can be found in Sephora and other beauty stores. On a paper towel I spritz a few good squirts onto one patch. Next taking one brush at a time I will gently sweep it back and forth to get the majority of the product off and onto the paper towel. I will continue squirting more cleanser and swirling the brush around until most of the gunk is removed from the surface. Now is when the deep cleansing comes into play. Normal people use baby shampoo which I have also, but as I have mentioned how much I hate this cold cream cleanser, I have been using a small dab of this per brush to help expedite finishing this jar of awfulness. Taking a small smudge I will gently massage this into the brush to help get out product that has found its way to the center of the brushes, as well as an extra sweep on the outside of what the spray did not catch. Then with warm water I will rinse and repeat, making sure at the final rinse that I have really gotten out all of the cleanser (or shampoo). Finally shake and squeeze out all excess water and then pat gently with a paper towel to get out as much moisture as possible. Use your fingers to gently shape the bristles back to their original shape. If possible, line your brushes with the bristles over the sink that way any more water can drain out instead of pooling into a cesspool of bacteria that your nicely clean brush would then be laying in. 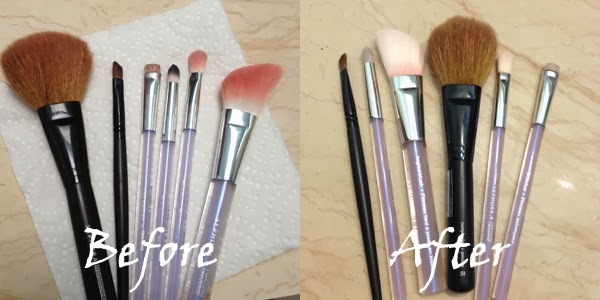 Once your brushes are completely dry, fluff them up and they will look just like new!